This is a review of a paper recently published by my group. Here, the paper is paraphrased to reach a wider audience. The plasma physics community can read the original publication, so my goal is to provide an example of current plasma physics research to the general public. The following review should be at a high school level and I appreciate any comments you may have regarding how to clarify it further. If you are interested in physics research, then I hope this helps to feed your curiosity. This is a review of the paper titled, “Exponential Frequency Spectrum and Lorentzian Pulses in Magnetized Plasmas”. The published version of the paper can be downloaded from the following links. Statements Required by the Publisher: Copyright (2008) American Institute of Physics. This article may be downloaded for personal use only. Any other use requires prior permission of the author and the American Institute of Physics. The following article appeared in Phys. Plasmas 15, 122304 (2008) and may be found at http://link.aip.org/link/?PHP/15/122304. Figure 14a from the paper, example of a pulse in the time series data. An introduction to this work is provided on this page and the downloadable publication provided there. That first paper will hereafter be referred to as the PRL. The paper reviewed here (the POP) is longer and contains new material concerning the modeling of exponential power spectra as generated by the presence of Lorentzian shaped pulses in the time series data. 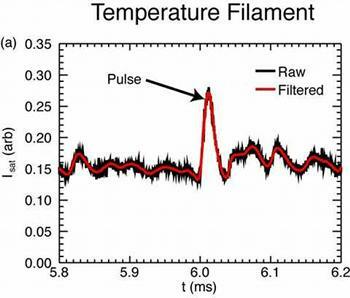 The basic idea behind all of this work is that we observe pulses, or spikes, in the plasma. These pulses are not always present, but whenever they are, the power spectrum of the data features an exponential dependence in frequency. The figure to the right provides an example of a pulse that was measured in one of the experiments. There are some background fluctuations, but the labeled pulse is clearly a unique feature of this signal. This is figure 14a from the paper. Figure 6 from the paper, example of an exponential spectrum (such a spectrum appears as a straight line when plotted semi-log as in this figure). In the next figure (figure 6 in the paper) an example of an exponential power spectrum is shown. The amplitude of the power spectrum decays exponentially with respect to the frequency. When such a spectrum is plotted in a semi-log format (logarithmic y-axis and linear x-axis), the exponential behavior appears as a straight region. In this particular example there are peaks in the spectrum that correspond to coherent waves. The exponential part of the spectrum is identified through the linear fit (a fit to the logarithmic format of the result) shown as the dashed red line. Can other pulse shapes generate exponential spectra (how do you know these pulses are Lorentzian)? Is it possible to observe an exponential spectra with just about any combination of pulse-like features? The data appear to show some non-symmetric pulses, can these be accounted for in the resulting spectra? The three questions above can all be addressed through analytic models of the pulses and spectra. Beginning with the question of whether non-Lorentzian shapes can generate exponential, the answer is yes. The argument in favor of the observed pulses being Lorentzian is that other pulse shapes, while potentially generating exponential spectra, do not produce the agreement between the pulse width and the exponential decay constant. As the PRL showed, there is a relationship between the temporal width of a Lorentzian pulse and the exponential decay constant of the power spectrum it produces. Presently, only the Lorentzian shape satisfies this relationship. Figure 16 from the paper, showing the different spectral shapes resulting from different pulses. The figure to the right is figure 16 from the POP. It plots the power spectra resulting from three different pulse shapes: Lorentzian, Gaussian, and hyperbolic-secant squared. While not shown in the paper, these three shapes are all very similar near their peaks. The differences between them are realized in the wings, away from their centers. Looking at the raw data from the experiments it would be reasonable to attempt to fit the pulses to any of these shapes. To compare their resulting power spectra, we analytically calculated the spectrum resulting from each pulse after giving them all the same temporal width. The figure shows that the Gaussian spectrum is not exponential across any frequency range. The hyperbolic-secant squared spectrum is exponential at the higher end of the frequency range, but not at the lower frequencies. The Lorentzian spectrum is exponential across all frequencies. This initially seems to indicate that the hyperbolic-secant squared is a viable candidate for the pulse shape. It turns out that this is not the case, however, because the relationship between the pulse time-width and the exponential decay of the spectrum is not consistent. The spectra plotted in the figure all come from pulses with the same temporal width. The exponential parts of the Lorentzian and hyperbolic-secant squared spectra exhibit different slopes (the exponential part of the hyperbolic-secant squared spectrum is plotted as the dashed black line). This means that the spectrum produced by the hyperbolic-secant squared pulse would not allow for the calculation and prediction of the pulse width. In the experiments, however, we have shown that calculating the exponential behavior of the spectra allows for the determination of the widths of the pulses that generated it. Therefore, while this is not an exhaustive study of every single mathematical pulse shape in existence, it does show that there are no obvious examples of pulses other than Lorentzians that generate the same agreement between pulse and spectral characteristics. Figure 17 from the paper, showing the different spectral shapes resulting from pulse sets with different distributions of time widths. The next question addressed by the POP is whether exponential spectra are generated from any collection of pulse-like features. A model of Lorentzian pulses is constructed to test the sensitivity of the exponential spectral behavior with respect to the temporal widths of the pulses. In the figure to the left, two power spectra are plotted from different model sets. The Broad spectrum (dotted red line) is produced from a set of Lorentzian pulses in which the temporal widths vary between 2 and 10 microseconds. The Narrow spectrum (solid black line) is the result from a set of Lorentzian pulses in which the temporal widths vary only between 2.5 and 4.5 microseconds. For the same total number of pulses in each set, the Narrow set features a much more consistent range of pulses (i.e., the pulses are much more similar to each other within this set). The figure shows that the power spectrum from the Narrow set exhibits exponential behavior over a greater frequency range than that of the Broad set. 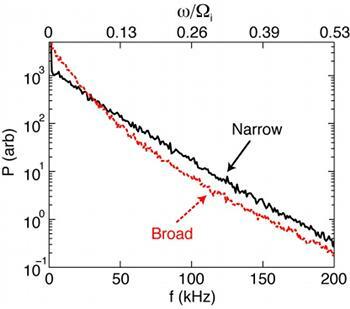 The Broad set loses its exponential behavior at lower frequencies. The relevance to the experiments is that since we measure exponential spectra over wide frequency ranges (see figure 6 as shown above), that implies the pulses in the experiment feature a narrow distribution of temporal widths. A consequence of this result is that if the pulses feature such consistent widths, then there is likely a generation mechanism that can explain the production of the pulses themselves. There are measurements of hundreds of pulses for a given experimental setup, and thousands of pulses overall, so the observation that exponential spectra are only observed when these pulses are reproducible and consistent in width is a powerful conclusion. In fact, it appears as though a completely random collection of pulses does not spontaneously result in an exponential power spectrum. The pulses need to feature the same shape and similar time widths. 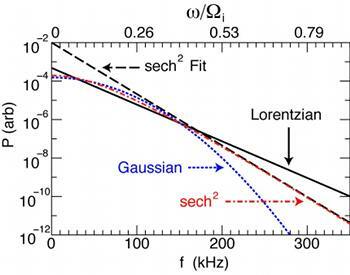 Figure 14b from the paper, example of a Lorentzian fit to the pulse from figure 14a. The final question covered in the POP concerns the observation of non-symmetric pulses. We claim that Lorentzian pulses generate the exponential power spectra, yet there are clearly examples of pulses that are not perfect Lorentzian shapes. One such example is shown in figure 14b from the paper, which is reproduced to the right. 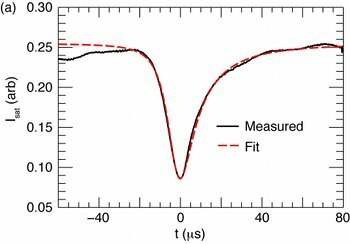 The measured pulse (solid red) is analytically fit to a Lorentzian shape (dashed black). 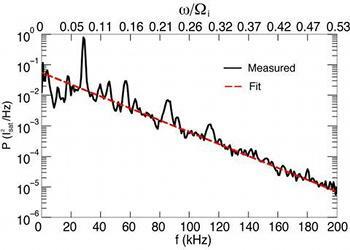 It is clear that the fit is not perfect because the measured pulse is asymmetric. The leading edge (left side) of the measured pulse is steeper than a Lorentzian. While the trailing edge (right side) of the measured pulse is a very good fit, this still leads to the question of whether asymmetric, or skewed, Lorentzian pulse shapes can generate an exponential spectrum. Figure 18a from the paper, fitting a skewed Lorentzian pulse to a measured pulse. To model the behavior of non-symmetric Lorentzian pulses we modified the standard pulse shape with a multiplicative term shown as equation 9 in the paper. The result of this modification is that the pulse features a steepened edge. The figure to the left takes one of these modified Lorentzian fits as applied to a pulse from one of the experiments. Notice that even though this measured pulse is negative polarity (compared to the positive polarity of the pulse at the beginning of this review), the leading edge is once again steeper than the trailing edge. 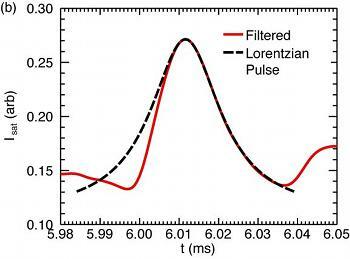 The measured pulse (solid black) is fit exceptionally well by the skewed Lorentzian (dashed red). Furthermore, figure 18b of the paper plots the resulting power spectra from models of either a pure or a skewed Lorentzian and shows that the resulting exponential shape is not changed by the skewing. The conclusion is that non-symmetric pulses in the measured data do not prevent the exponential spectrum from being observed. In a physics paper the relevance of the work is established in the beginning. In a review like this, however, it works better to explain the physics first and then put the results into context. This work experimentally observes pulse structures of a particular shape that only arise when the system has transitioned to a turbulent state (that is all shown in the PRL). The structures exhibit consistent time widths, implying that the generation mechanism is constant during their production. Turbulence is generally associated with the loss of coherent waves and the production of a broad spectrum of fluctuations. Here, however, it is shown that a very narrow-band behavior (the narrow distribution of pulse widths) is required to observe the broadband feature (the wide-ranging exponential frequency behavior). This is a unique result that may be the beginning of new developments in plasma turbulence and transport. The bigger picture still needs to be determined. For example, what causes the pulses? If they are produced by a non-linear interaction of electromagnetic plasma waves, then it is likely that this same behavior occurs in other plasmas, both in space and in the laboratory. As such, we suggest that the pulses and exponential power spectra are a universal feature of plasma turbulence. If a Lorentzian shape is the result, then perhaps we can now work backwards to describe plasma turbulence with a set of solvable equations. What differential equations feature Lorentzian pulses as their solution? Perhaps these same equations can describe plasma transport in a new way. Plasma transport is important for understanding phenomena such as the solar wind and aurora in addition to the present challenge of developing nuclear fusion as an energy source.